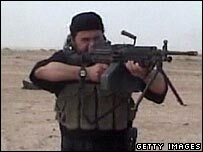 BBC NEWS | Middle East | Analysis: Will Zarqawi's death ease woes? Analysis: Will Zarqawi's death ease woes? The death of Abu Musab al-Zarqawi is obviously a major success for the new Iraqi government and the US, but it remains to be seen if this marks the beginning of the end of the insurgency. If it significantly weakens the al-Qaeda structure in Iraq, it could open the way for easier contacts between the government and other insurgents, who are more Iraqi nationalists than Islamists seeking to set up an Islamic state not only in Iraq but across the region. It might also lead to a lessening of tension between Sunnis and Shias, whom Zarqawi targeted. The new government, the first constitutional one, will have to seize this opportunity if it is not to suffer the fate of its predecessor administrations, which came to office with hope and left with disappointment. However, the death of one man does not necessarily bring a breakthrough. One recalls the euphoria after the capture of Saddam Hussein in December 2003. US President George W Bush declared then: "A hopeful day has arrived. All Iraqis can now come together and reject violence and build a new Iraq." His close ally UK Prime Minister Tony Blair echoed his words: "Let his capture bring about unity, reconciliation and peace between all the people of Iraq." It did not happen, as we have seen. And even after Zarqawi's death, neither the al-Qaeda elements nor the nationalists will give up. Indeed, Zarqawi's removal might well bring about an explosion of revenge by his followers. And getting the nationalists into talks and into politics is going to be a long-drawn out affair since they have their price to exact in the form of demands for an early US withdrawal. The current Iraqi government and its security forces are not strong enough to stand alone. If there is one sign of hope, though, it is that Zarqawi was calling for conflict between the Sunnis, of whom he was one, and the Shias, whom he despised. In a recent audio tape, in which the speaker is said to be Zarqawi, the Shias are attacked as collaborators and any attempt at reconciliation is rejected. The speaker calls on Iraqis to "wake up, pay attention and prepare to confront the poisons of the Shia snakes". "Forget about those advocating the end of sectarianism and calling for national unity," he adds. With Zarqawi's removal, there might be more chance of reconciliation between Sunnis and Shias. Conflict between them has led to many deaths recently. Some say that a civil war has already started, though others not. Whatever it is called, many are dying. Zarqawi had for long been an enemy of the Shias. In June 2004, a letter believed to be from him to Osama Bin Laden warned of difficult times but expressed determination to attack four targets: the US forces, the Kurds, the Iraqi police, army and their agents, and the Shias. It described the Iraqi police and army as "the eyes of the occupiers, the ears with which they hear, and the hand with which they strike". The holy warriors, the mujahideen, were determined to target them before the occupation takes hold, the letter vowed. In fact, they have had considerable success. How much that has been due personally to Zarqawi is impossible to assess. It is likely though that he has had a considerable impact in terms of leadership, tactics and inspiration. But he was not a one-man band. There has in fact been some discussion about how central a role Zarqawi had been playing of late. Earlier this year, a new central body called the Mujahideen Council was formed to try to unify parts of the insurgency, but Zarqawi's name was not mentioned. If Zarqawi was being by-passed, that indicates perhaps that other elements were growing stronger and are therefore not going to be affected by his absence.